Thursday morning, the Texas Rangers selected Russell Wilson, starting quarterback of the Seattle Seahawks, in the Rule 5 Draft and while he likely won’t ever be in the lineup, someone already is making an attempt to capitalize on acquisition. 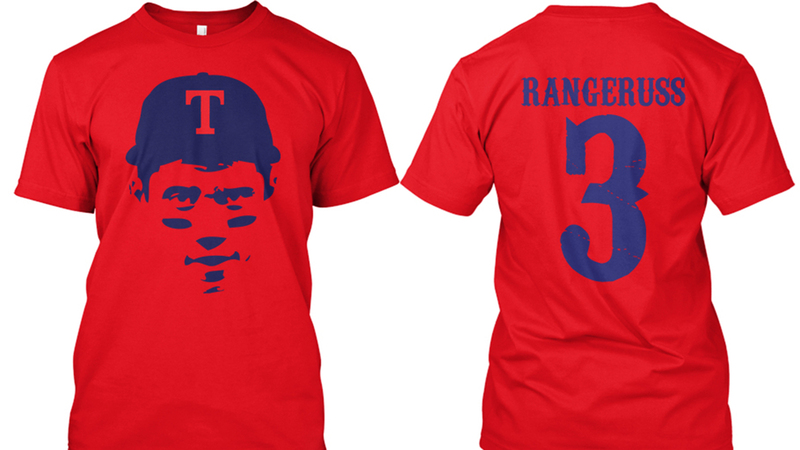 The T-shirt’s back even gives Wilson a new, catchy nickname of “Rangeruss” to commemorate his baseball rights going to Texas from Colorado. Most agree Wilson isn’t going to sacrifice any of his successful football career to become the next Bo Jackson or Deion Sanders, but Rangers GM Jon Daniels did say the Seattle quarterback has accepted an invite to spring training in Surprise, Arizona this upcoming season to come “hit BP, take grounders and pretend he’s a baseball player again” and to use his leadership skills to be a motivational speaker. Who knows? Maybe after his spring training appearance there can be a real image of Wilson in a Rangers ball cap to put on a T-shirt. This is what @DangeRussWilson looks like in a Rangers uniform.